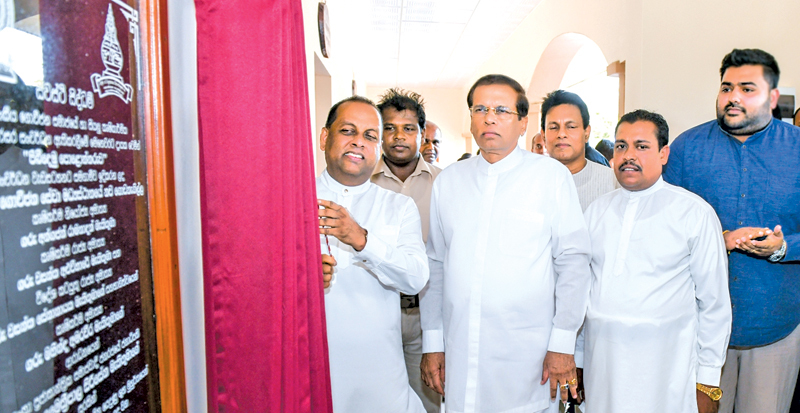 President Maithripala Sirisena opening the Welikanda New Agrarian Services Centre. Picture by President’s Media. Whatever the allegations levelled by political opponents, this era can be considered as a fortunate time for the agricultural economy, said President Maithripala Sirisena. The President said the government has been working in a systematic and comprehensive manner over the past three and half years to provide solutions for the water shortage faced by farmers for a long time. He made these remarks participating in the opening ceremony of the Welikanda New Agrarian Services Centre on Monday. President Sirisena added that the government is committed to ensuring the prosperity of the farming community and their economy without allowing their future generations to be affected by the hardship and suffering faced by them. Speaking on the development activities of the Welikanda area, President Sirisena said the Welikanda Drinking Water Supply Project, launched to solve the drinking water issue of the people in the area, will be completed by the end of next year. “While some expect short-term solutions in the development process, at present, development programmes are being implemented with a comprehensive plan and a future vision,” the President said, adding that there is no uncertainty in the country as certain media try to project. The government is fulfilling a large number of development projects, he emphasized. Responsibilities towards the country and its people will be fulfilled successfully facing challenges, he added. The amount spent on the Agrarian Services Centre, built with all facilities under ‘Pibidemu Polonnaruwa’ district development programme, cost Rs. 13 million. The President unveiled the commemoration plaque and opened the Agrarian Services Centre. He also went on an observation tour of the premises. The President planted a sapling in the Agrarian Services Centre premises. The Agriculture and Agrarian Insurance Board provided compensation to farmers for damaged crops due to inclement weather. Cheques were handed over by the President. Agricultural toolkits were also distributed by the President. Minister Mahinda Amaraweera, Deputy Minister Angajan Ramanathan, public representatives of the area, Agriculture Ministry Secretary B. Wijeyrathna, Commissioner General of the Department of Agrarian Development W. M. B. Weerasekara and Polonnaruwa district Agrarian Development Assistant Commissioner B. M. C. H. Kumarihami were present. That is why we see so many road blocks and protests by farmers! May be they are aggitating as a means of physical excercise ? What deceit!